Shohei Ohtani made his spring training debut with the Angels yesterday. It wasn't a great outing - he gave up two runs on two hits and one walk while striking out two in 1 1/3 innings pitched - 31 pitches total. One of the runs was unearned but the other one scored on a long home run by Keon Baxter. It'll be interesting to see how he does in his next outing - probably next weekend. He's expected to make his batting debut sometime this week. This is a card issued by BBM that apparently ties into a charity called the Fighters Foundation which I assume is an charity with ties to the team. I did some searching on the Fighters' website but I didn't find anything relating to the card specifically. 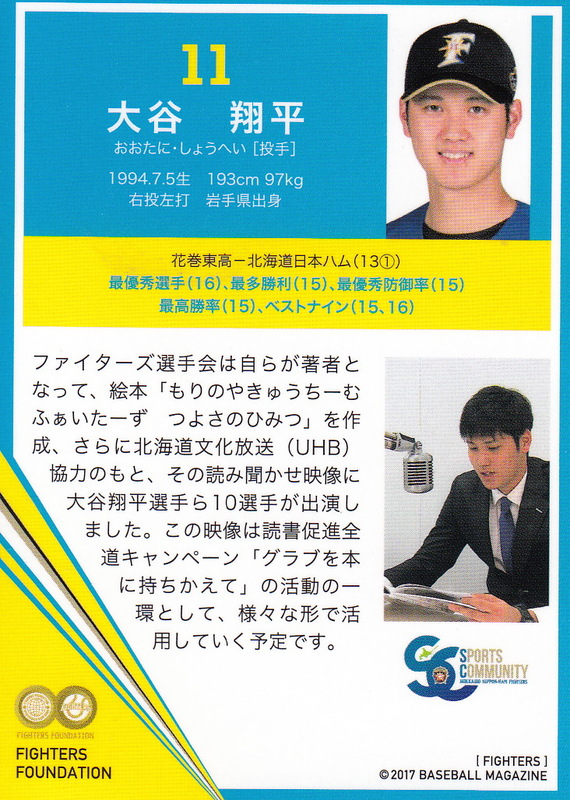 I did find an item from December of 2016 that the photo on the back is from - it looks like Ohtani along with several other players including Sho Nakata and manager Hideki Kuriyama appeared on Hokkaido Cultural Broadcasting (UHB) TV to read storybooks. I suspect the text on the back has something to do with this since I see "UHB" in the middle of it. 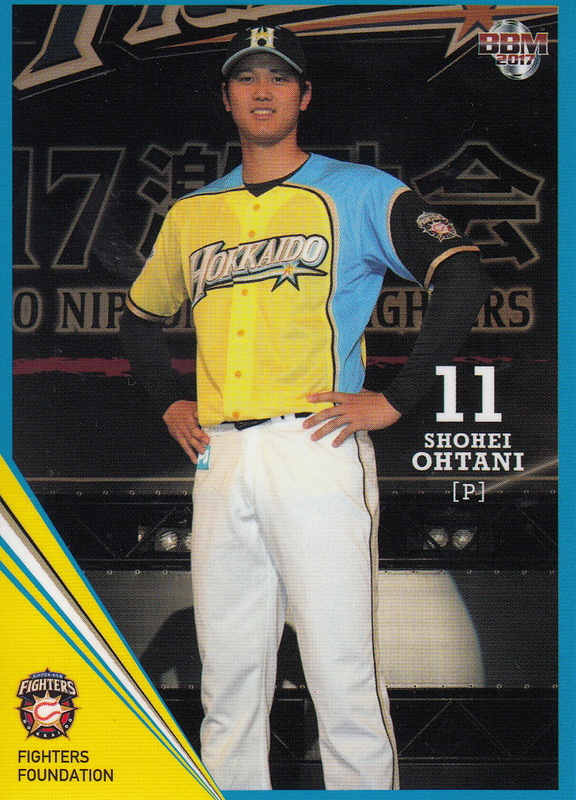 The uniform was worn by the Fighters in early 2017 so the card must have been released after that. The design of the card is very similar to BBM's Fighters team set from last year. There's no card number so I don't know if there are any other cards like it. I got another package of vintage cards from Alex a few weeks back. Alex - who lives in the UK - had offered to send me a bunch of old cards in exchange for me acting as a proxy for him to order cards from Sportslots - basically he would order the cards and have them shipped to me and I would forward them on to him once I received everything he ordered. It was a sizable lot of cards that he sent me so as always I feel like I still owe him. 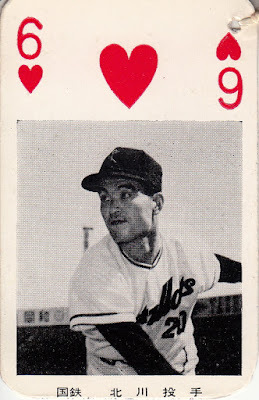 I do want to point out that just because all the Swallows cards I have are 6's and both Hawks cards I have are 10's, that doesn't mean all the Swallows cards are 6's and all the Hawks cards are 10's and vice versa. 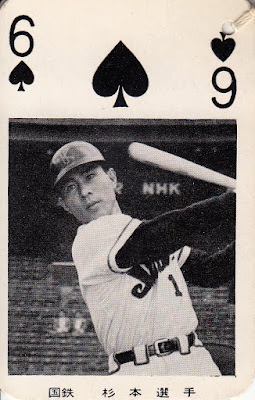 The Six Of Diamonds is Kihachi Enomoto of the Orions and the Ten Of Clubs is Wally Yonamine of the Dragons. The rest of the cards sent me were all bromides. This is a 1950 Yamakatsu JBR41 card of Masakazu Kato of the Kintetsu Pearls. Kato only played two years in NPB - he played for Kintetsu's first two seasons in 1950 and 51. 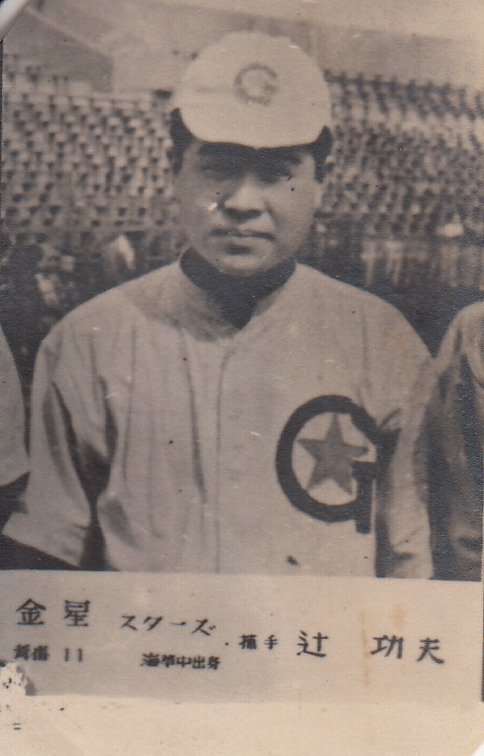 His brother Haruo was the team's captain. 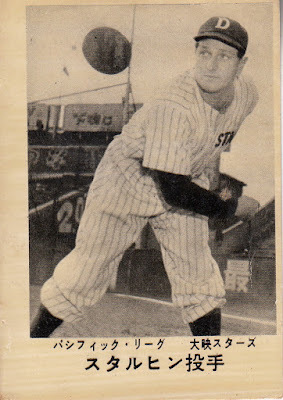 This is a bromide of pitcher Takashi Eda of Goldstar which based on the uniform is probably from either 1946 or early 1947. I have another card from the same uncatalogued set of another Goldstar player Isao Tsuji. I think that these next two cards are also from around 1946-47 based on the fact that they show two members of the Kinki Great Ring which is the name that the team that's now the Fukuoka Softbank Hawks went by those two seasons. They both appear to be uncatalogued. 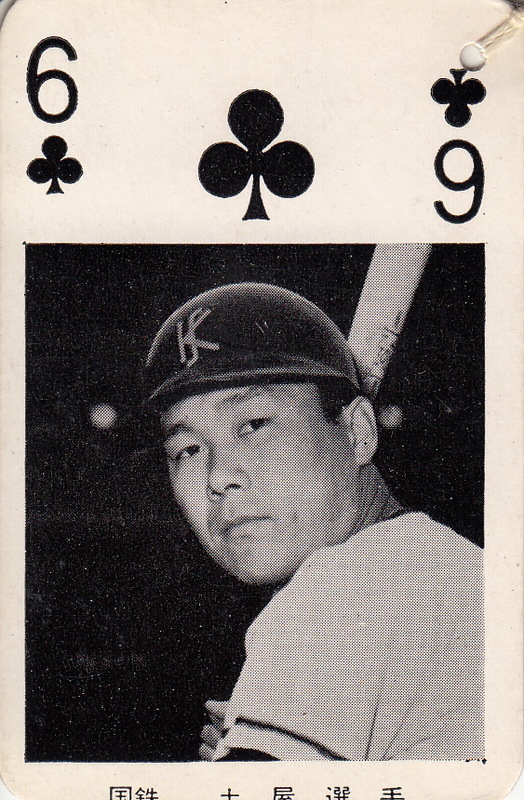 The first card is Hall Of Fame manager Kazuto Tsuruoka (who went by the name Kazuto Yamamoto at the time). The other card I think is Naofumi Yasui who had an 11 year career with the Hawks, Whales and Unions between 1943 and 1955 (he missed two seasons due to the war). I haven't been able to figure out ANYTHING about this next card. All I can tell you is the player is a right handed pitcher. The text is hard to make out and I can't figure out what uniform the player is wearing either. I'm mostly stumped by this next card as well. I think that the team is the Kinki Great Ring (it's written out in parentheses in the middle of the text on the bottom of the card. But I'm not sure of the text on either side of the team name. 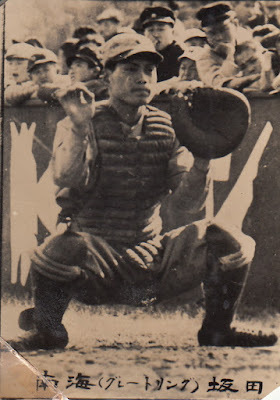 This might be Kiyoharu Sakata who was one of the team's catchers in 1947. The kanji doesn't really match though. If it is Sakata then the card is from 1947 - it was the only year he played for Kinki. 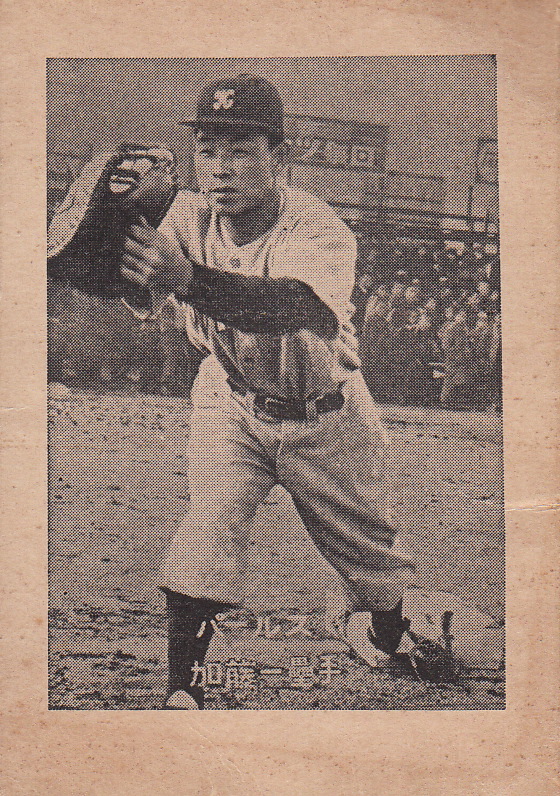 I think the card is uncatalogued - Engel's listing for the 1947 JBR 36 "Team Nickname in Parentheses" set lists a card for Sakata that's described as "catcher squatting" but I'm not convinced that this card is that one. 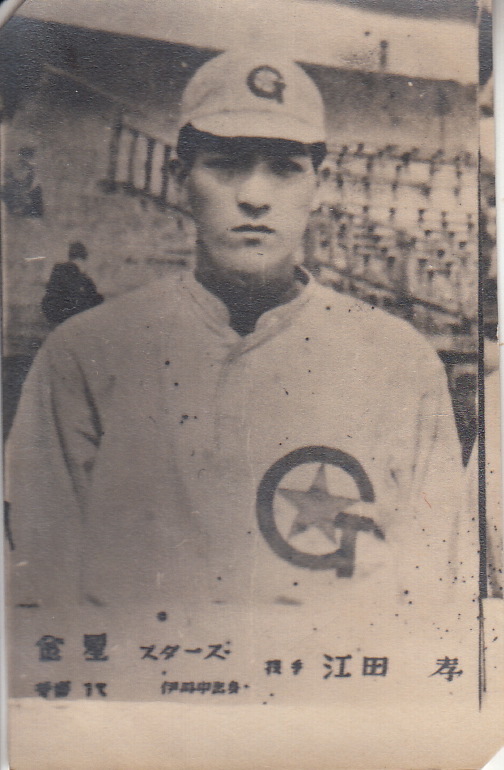 Next up is another catcher that I'm not sure of the identity of. 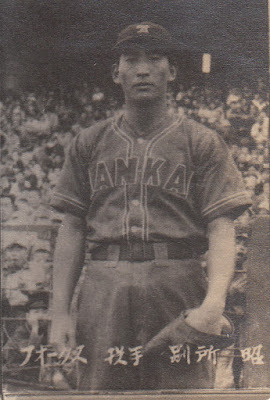 The team at least is obvious and the design of the uniform places the photo from 1948. I can't quite match the player's name however. Only one of the large kanji characters is the player's name - the other two (the two on the bottom) say "catcher". 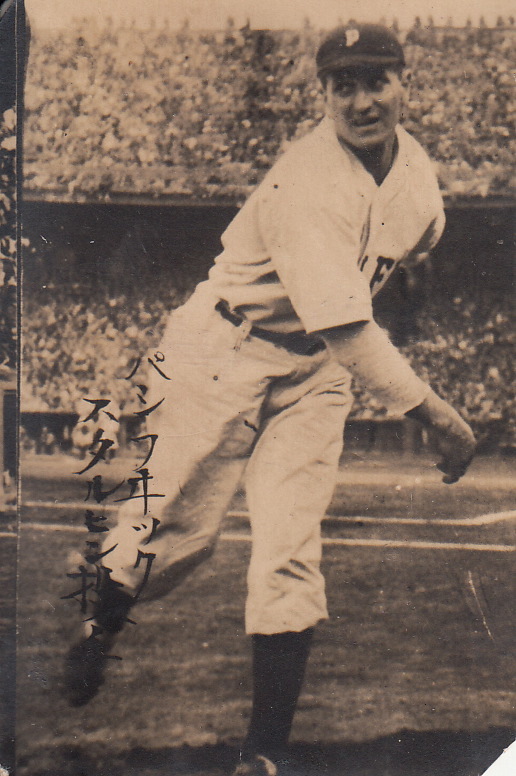 I think this is Shigejiro Kanbayashi because he's the only guy who caught in any games by the Dragons in 1948 who has that kanji in his name - although it's the second kanji for his last name. The card appears to be uncatalogued. Kanbayashi only spent 7 seasons in pro ball from 1947 through 1953 with the Dragons, Flyers and Orions. 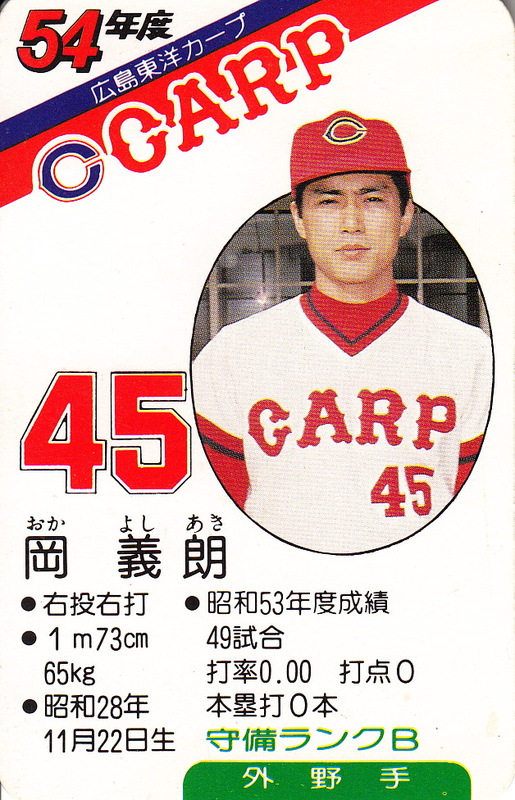 Between playing several years in the corporate leagues after graduating from Meiji University and (I assume) the war, he didn't debut with the Dragons until he was 30 years old. He became a politician after he retired. 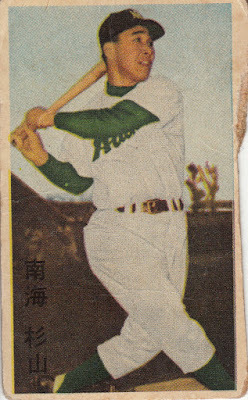 This next card may be from the same uncatalogued set as the last one although they aren't quite the same size. 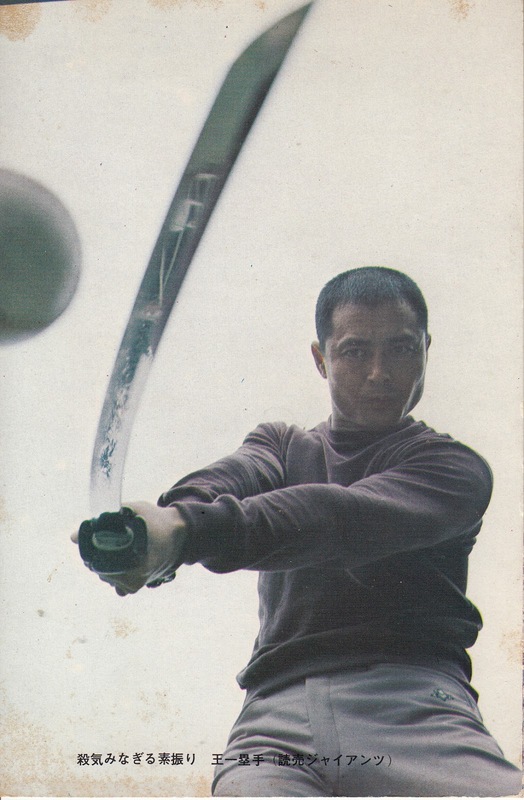 I'm pretty sure that this one is Shoji Kato of the Kyuei Flyers. Kato only played for the Flyers in 1948 so again that helps date the card. 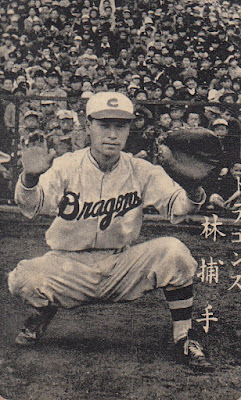 Kato entered signed with the Dragons in 1939 out of Chuo University. He had three separate stints with the team - 1939, 1943-44 and 1946-47 - I assume the time between each stint was spent with the military. After playing for the Stars in 1948 he spent the last four years of his career with the Stars. 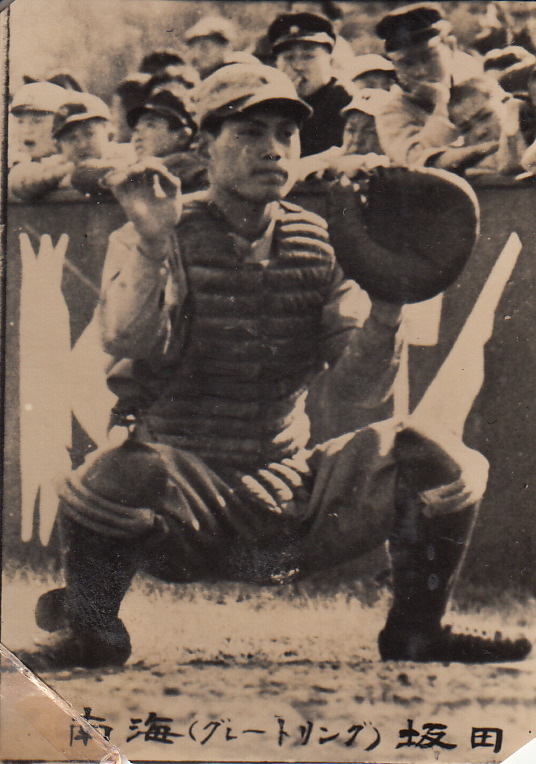 He became coach of the Chuo University baseball team after he retired and tragically passed away of liver cancer in 1958 at the age of 44. 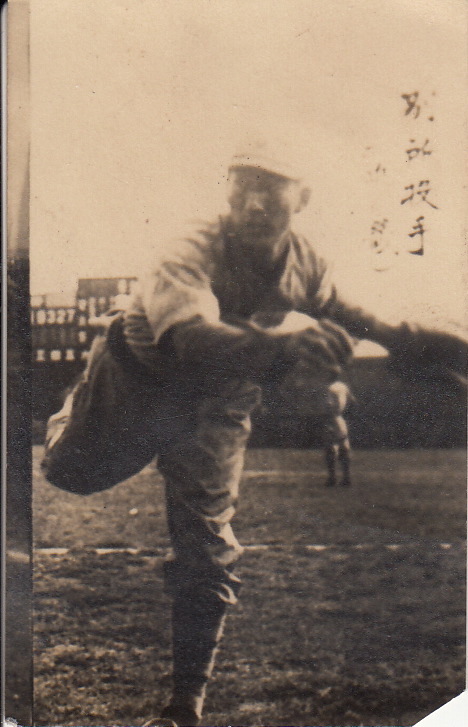 This card is of Hall Of Fame pitcher Takehiko Bessho. 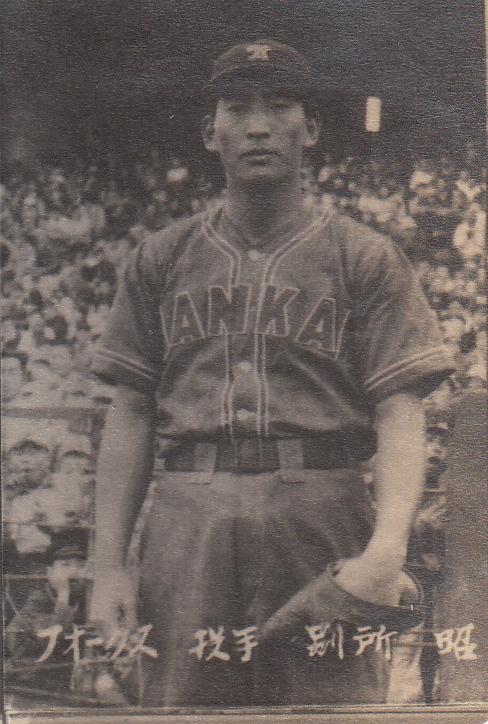 The uniform in the photo was worn by the Hawks from 1947 to 1949 but Bessho had left Nankai after 1948 so the card must be from 1947 or 1948. 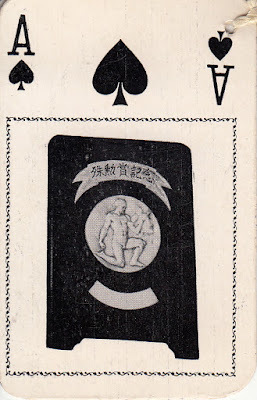 Once again the card appears to be from an uncatalogued set. Engel lists a couple mid 1950's sets in the bromide section of the guide that are essentially transitions to the "tobacco menko" sets of the late 50's/early 60's. These sets are roughly the same size as the menko (1 3/4 inches wide by 3 inches high) and have menko-ish fronts. On the other hand they are blank backed and lack the typical menko card decorations (random numbers, rock-paper-scissor symbols, etc). 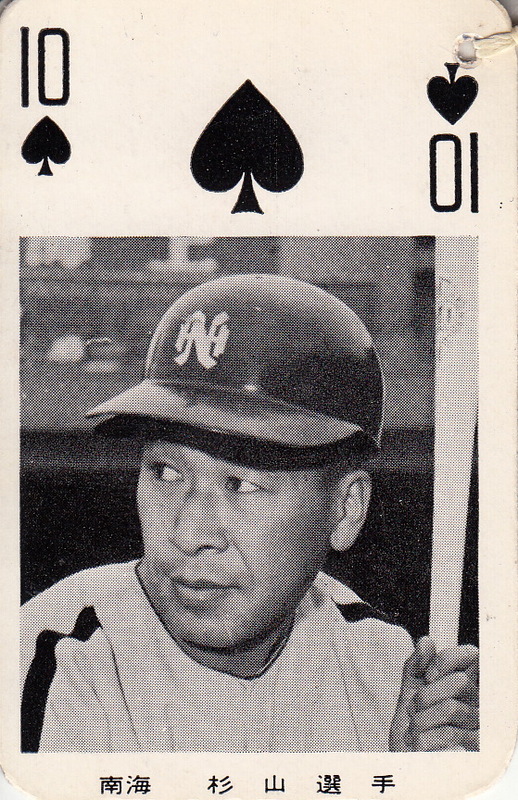 I think this next card is from one of these sets although it may be uncatalogued. 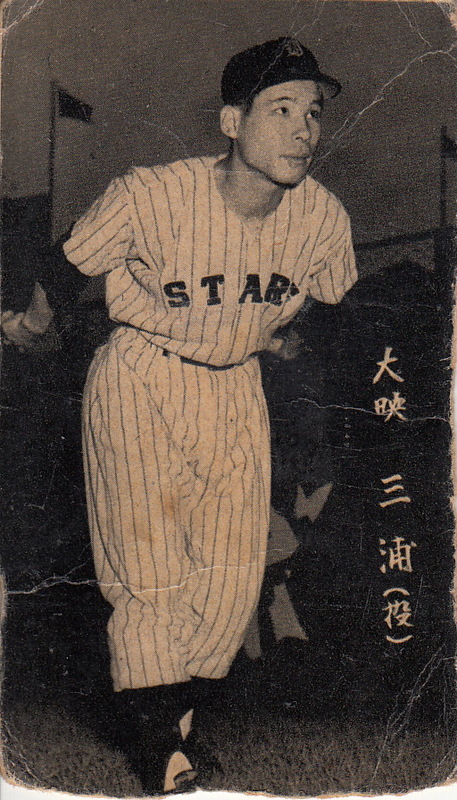 The player is Masayoshi Miura of the Daiei Stars who only played for the Stars in 1956 - he lead the Pacific League in wins that year with 29, over half of the 57 wins the 7th place (out of 8 teams) Stars had that year. This card could be from the JBR 17 set but Engel lists that set as a 1957 set - not that they couldn't have used a 1956 photo in a 1957 set. 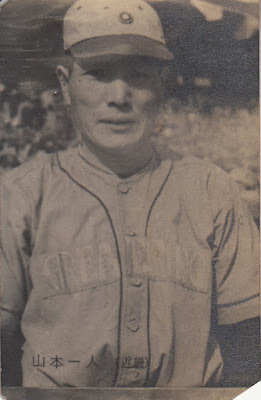 The Stars merged with the 8th place Takahashi Unions in 1957 to become the Daiei Unions - Miura followed up his Victory Leader season by leading the PL in losses in 1957 with 21 for the team which finished last in its sole season before merging with the Mainichi Orions. 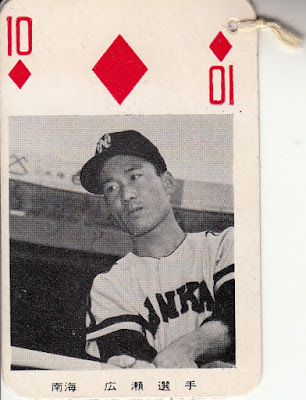 These next two cards are also "tobacco menko" sized but based on the uniforms shown in the photos they're from a few years earlier than the other "transitional" sets. The Giants uniform was used from 1951-52 and the Dragons uniform was used from 1952-53 so it would place the photos from 1952 obviously. 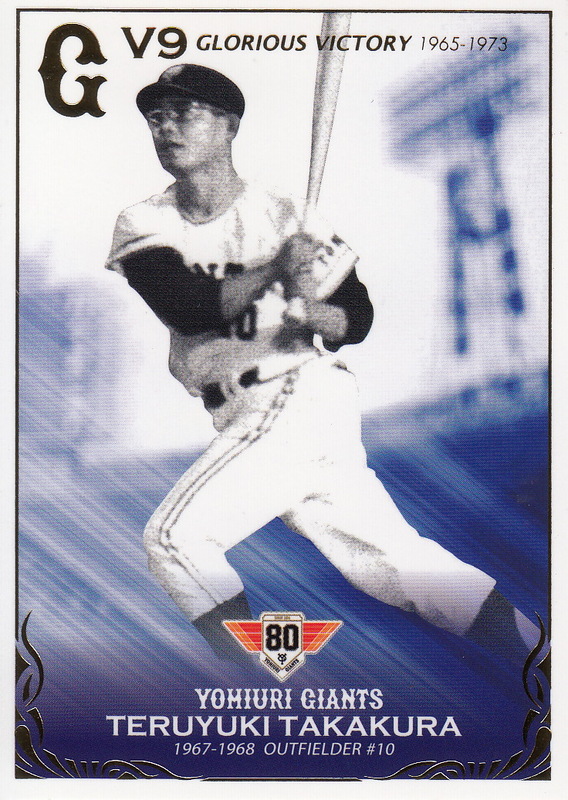 There's no text on the cards but I think the Giants player is Hideo Fujimoto and the Dragons player is Michio Nishizawa, both Hall of Famers. I'm almost positive that this next card is of Tsutomu Wakamatsu of the then-Yakult Atoms. This is the uniform that Yakult wore between 1971 and 1973 and it looks like the uniform number is "1" which Wakamatsu wore in 1972-73 (and no one wore for the Swallows in 1971). But that's about all I know about this card. 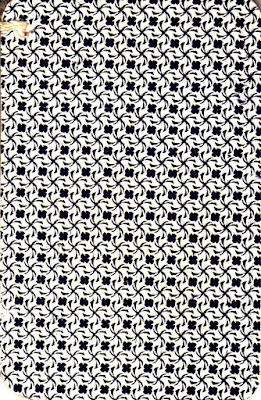 It's blank backed and a little large than the standard 2 1/2 by 3 1/2 card size. It looks like it could have been created by either Mel Bailey or Ed Broder but I know nothing about anything that either of them did that this could be from. I saved the best two cards for last. Alex sent me not one but TWO cards of Hall Of Famer Victor Starffin. 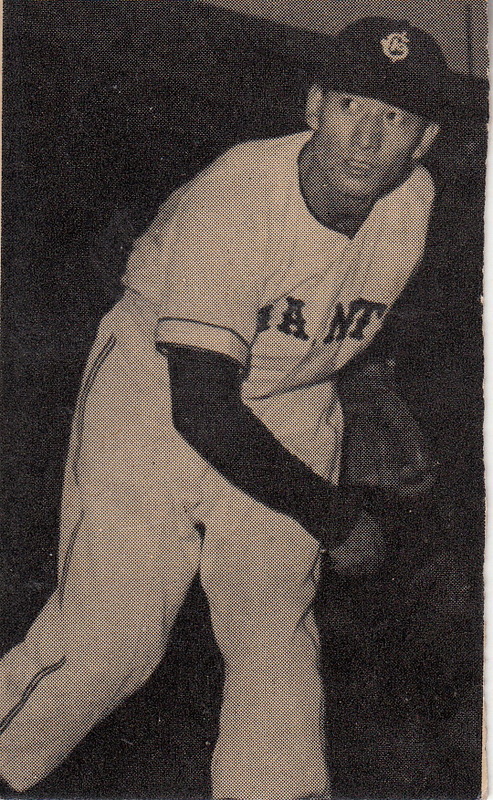 On this first card Starffin is wearing a Pacific uniform which is the name that the team that was later known as the Robins went by in 1946. The photo itself is a recrop of the card that Engel uses as a sample for the 1947 Marutoku B&W bromide set (JBR 73). 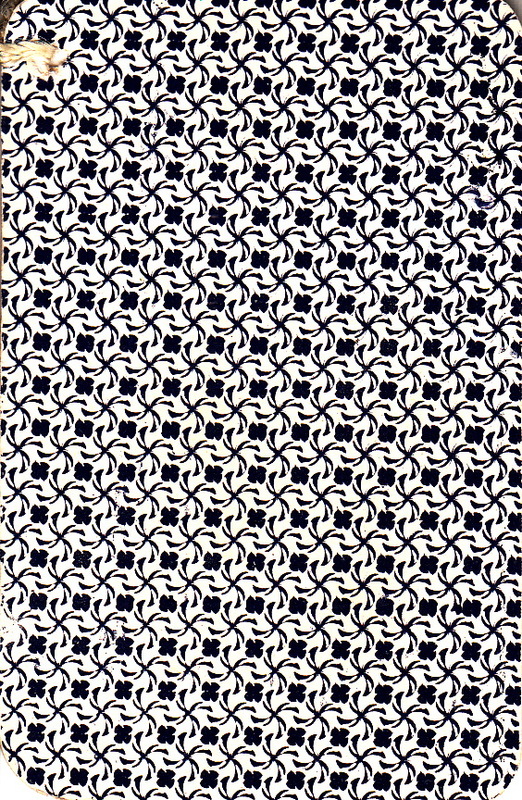 But the example card has white text as opposed to the black text on this card and this card is a little larger (1 3/4 inches by 2 11/16 inches) than the JBR 73 cards. So I'm guessing that this is from an uncatalogued set from either 1946 or 1947 (JBR 73 shows photos of players in their 1946 uniforms). The other Starffin card is a little easier. There were several sets issued by Marutoku in 1950 and 1951 that used this design. The sets were issued in different sizes. Of course this particular card is 2 1/8 inches by 3 inches which doesn't match the set description for any of the sets Engel lists although he points out that "checklists for many companion series are unavailable". So my bet is that this is from one of those other sets. The uniform that Starffin is wearing was worn by the Daiei Stars from 1951-54 so I'd go with 1951 as the year of the card. My thanks to Alex for sending me all these great cards! If anyone recognizes any of the cards I couldn't identify or sees that I'm wrong about something I've written here, please let me know. A bunch of new sets have been announced recently including the first flagship sets from BBM and Calbee. - BBM's annual 1st Version set will be released in early April. As always this is a pack based set issued in boxes containing 20 packs of 10 cards each. The set pretty much follows the same pattern as the last few years. The base set contains 372 cards - 324 player/manager cards (27 per team), 12 team checklist cards and a 36 card "Cross" subset that will be continued in the 2nd Version set later in the year. This year's "Cross" cards are called "Cross Universe" and have a space theme. There's the usual assortment of signature parallels for 108 of the player cards (9 per team) plus parallel versions of the rookie cards. BBM is also doing "secret" versions of 12 cards again (1 per team) - these are basically a photo variation parallel. There are three 12 card insert sets - "Japanism", "Gemstore" and "3D Cross Universe" and various autograph and memorabilia cards are available as well. - Calbee's Series One set is to be released around March 26th. The set will have 72 "regular" player cards (6 per team) along with a 12 card "Draft Pick" subset (featuring the #1 pick for each team from last fall's draft) and four checklist cards. 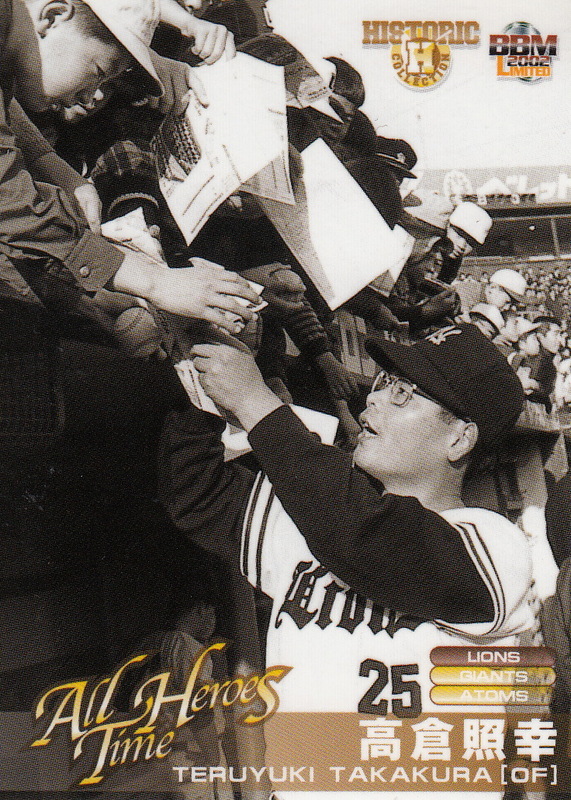 There's two premium subset/insert sets as well - a three card "Legend" set featuring three players who retired at the end of last season (Tadahito Iguchi, Yuya Andoh and Masahiko Morino) and the ubiquitous "Star" set containing 24 cards (2 per team). The checklist for the set is available on-line here. - Epoch is issuing a somewhat reasonably priced set for the Carp called "Rookies & Stars". Each box contains 20 5 card packs and retails for 8640 yen. The base set contains 90 cards. There is a 45 card insert set and there are 45 autograph cards available. I'm a bit curious how this set is going to be - 90 cards is enough to provide a card for everyone on the Carp's 70 man roster plus the ikusei roster. If that's what Epoch is doing then it may mean that they are going to attempt to take BBM on in the area of comprehensive team sets. There doesn't appear to be any mention of photo variants so maybe that craziness from last year is not going to be repeated this year. The set will be out on April 7th. - Epoch is releasing their next ultra high-end set in conjunction with the OB Club on March 24th. This one is called "Award Winners" and will run about 16,200 yen for a box containing six cards (at least two of which are autographed). There's 40 cards in the base set and 40 "holospectra" insert/parallel cards available. There are two types of autographed cards for each of the 40 players in the set and a couple "combo autographed ball booklet cards" available as well. 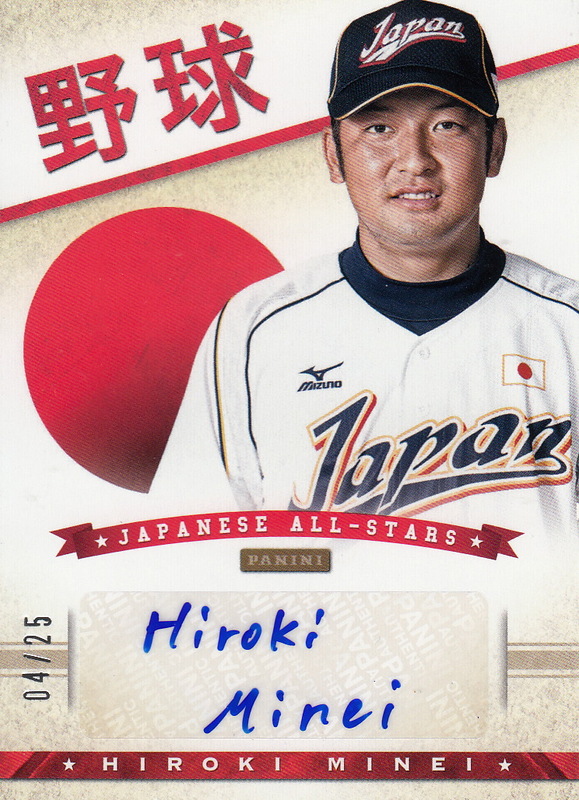 - Hits has returned with "Mini Color Paper" team sets for the Swallows and Baystars. Each set contains two different "papers" for each player/manager - 12 different ones for the Baystars and 13 different ones for the Swallows. 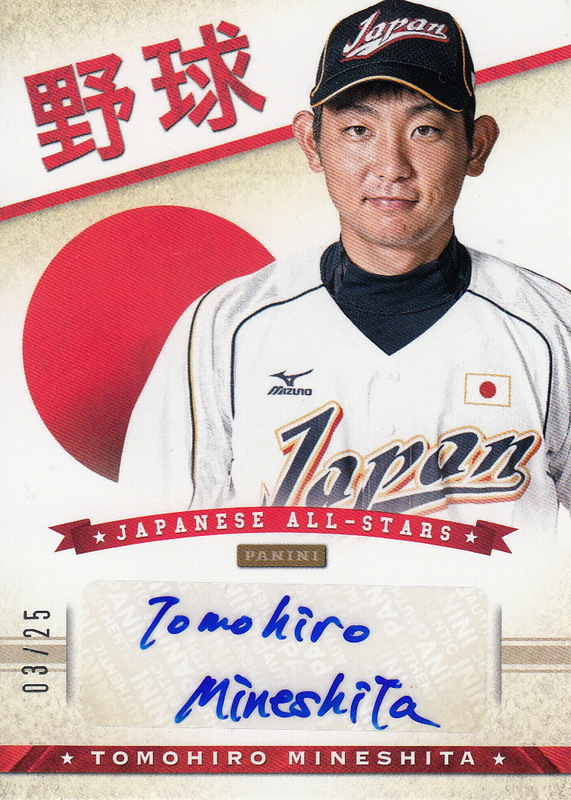 Each player has a "normal mini colored paper" and a "gilded print signed special mini colored paper". Both sets will be released on March 31st. 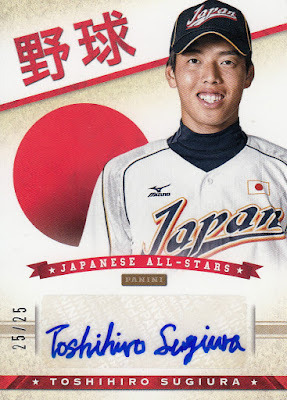 Over the years Calbee has issued a variety of items that were available when collectors redeemed "Lucky Cards" that were randomly placed in packs. 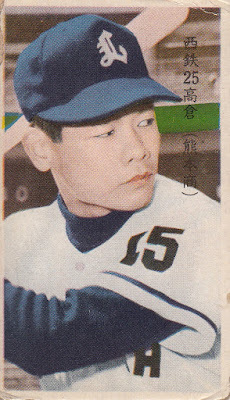 In Calbee's very first year (1973) collectors could receive large postcard sized cards as premiums. These cards were blank backed and are very rare. I was lucky enough to pick up a couple of them off Ebay recently. The first card shows a trio of great pitchers - Tsuneo Horiuchi of the Giants, Masaji Hiramatsu of the Whales and Yutaka Enatsu of the Tigers. 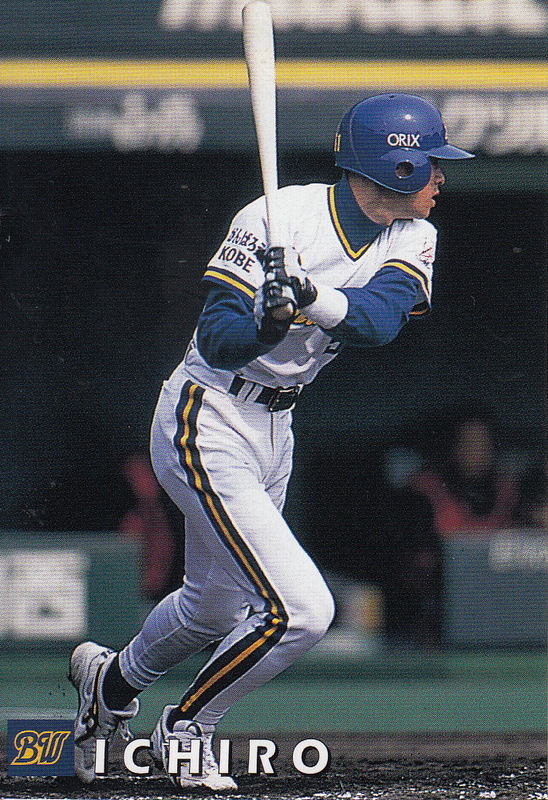 Horiuchi and Hiramatsu are both Hall Of Famers and Enatsu would be as well if it was not for his drug bust in the 1990's. 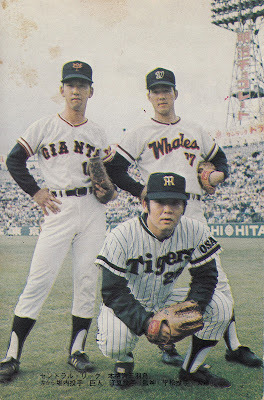 I think this photo was taken at Koshien Stadium at the third All Star game in 1972 but I'm not really sure (the Whales hat has the logo used up until that season). I can't find a lot about these cards anywhere. Neither SCM or the 1973 Calbee book mention them at all. The Calbee collector website has a brief couple of comments about them. 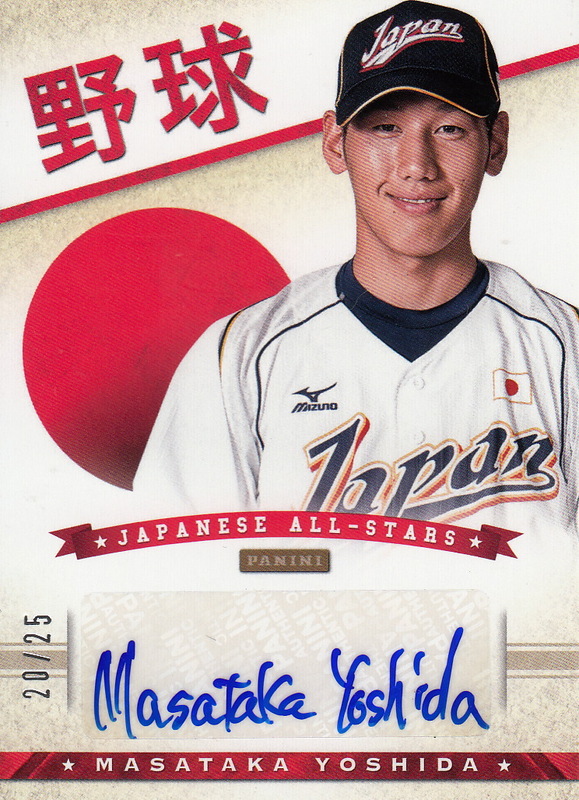 Engel lists about 20 of them but his list does not include the Horiuchi/Hiramatsu/Enatsu card. I feel very fortunate to have been able to get these. There was a news story about a month ago about a researcher in southern Florida discovering several previously unknown varieties of wasp. He decided to name one of them "Diolcogaster ichiroi" for Ichiro Suzuki, who has spent the last couple seasons in southern Florida playing for the Marlins. He's currently a free agent and it's still up in the air if he's going to play in MLB or NPB this coming season. I last heard a rumor that he was talking to the Rockies but I haven't heard anything more on that since last week. This is card #W-47 from the "West Special" set Calbee put out that year. Besides the "standard" set that year, Calbee did three additional 54 card sets that I assume were sold regionally. 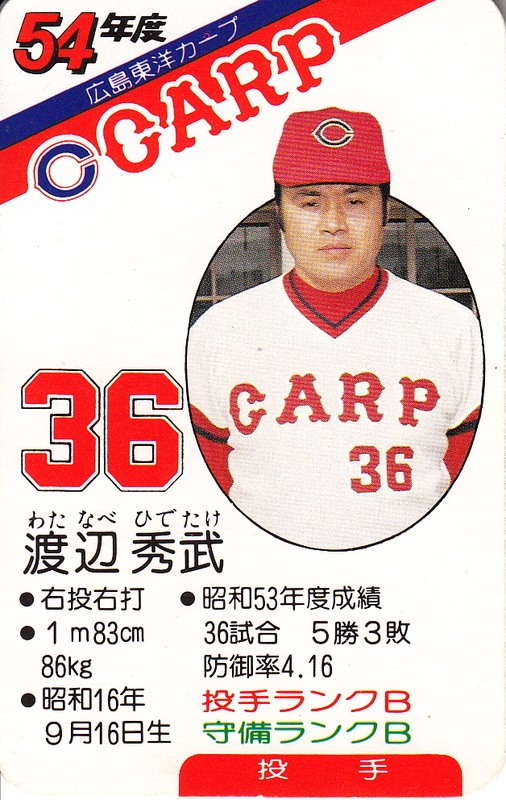 The "West Special" set just had cards for the six teams in Western Japan - the Hawks, the Carp, the Blue Wave, the Tigers, the Buffaloes and the Dragons. The "East Special" set just had cards for the six teams in "Eastern Japan" (essentially Kanto) - the Baystars, the Swallows, the Fighters, the Giants, the Lions and the Marines. The other set was devoted to the Giants. In 2013 Panini issued a box set for the USA National Teams (which included the collegiate, 18U and 15U teams). Each set contained a handful of autograph and memorabilia cards. The autograph and memorabilia cards had a number of different varieties. Oddly enough one of the varieties were autographs from the 2013 Japanese Collegiate National Team that Team USA had played in Japan in the first half of July that year. I've written about these cards in the past but I wanted to do another post on them because I think I've finally got the checklist down. There are 24 cards in the set. Each card contains a headshot of the player over what I think is a sticker autograph. Each card is numbered to only 25. I have five of these now and I'd love to get them all but I suspect completing the set will be financially unfeasible. Here's the checklist. For each player I list his uniform number, his college and what collegiate year he was in 2013 (1-4). 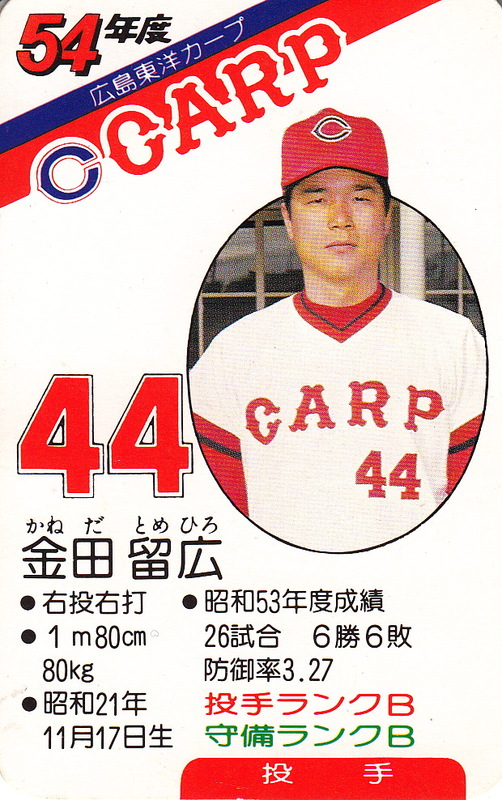 16 of the players were drafted directly from college into NPB so I list the year they were drafted along with the team that drafted them and the round. Two of the players were drafted after playing a few seasons in the industrial leagues so I list their industrial league team as well. The other six players have not been drafted yet - I was able to track down three of them in the industrial leagues - I suspect the other three may be there as well. 9 9 Shohri Ookido OF Hosei University 4 N/A N/A N/A ? 11 11 Masaji Rokuno P Tokai University 4 N/A N/A N/A ? 24 27 Ryohei Ishikawa C Kokugakuin University 4 N/A N/A N/A ? 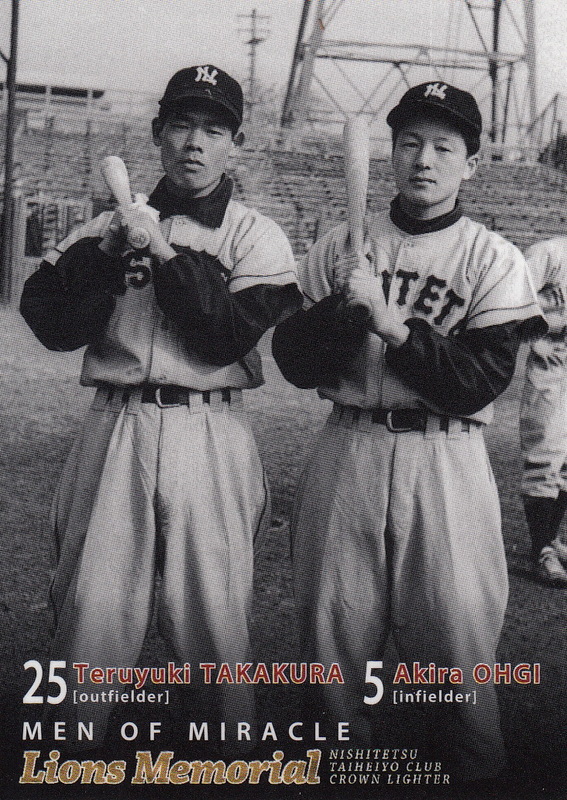 Former Lion, Giant and Atom outfielder Teruyuki Takakura passed away earlier this week at age 83. Takakura signed with the then-Nishitetsu Lions in 1953 after graduating from Kumamoto Shogyo High School. 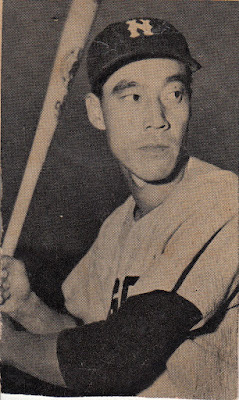 He got his chance to break into the Lions lineup in 1954 when left fielder Etsuro Otsuka contracted tuberculosis and he remained a starting outfielder for the Lions for the next 13 seasons. 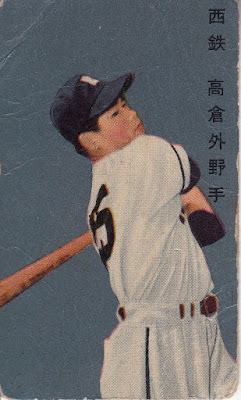 He was the leadoff hitter on the Lions V3 team - the team that won three consecutive Nippon Series from 1956 to 1958. He was traded to the Giants following the 1966 for Katsutoshi Miyadera in a cost-cutting move by the Lions. He had a fairly strong first season with Yomiuri but lost his starting job to rookie Shigeru Takada in 1968 and the team released him after the season. 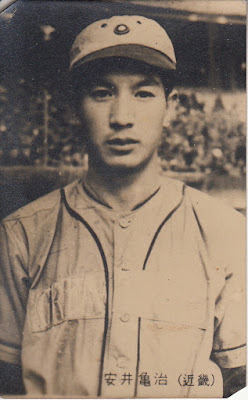 He hooked on with the Sankei Atoms for 1969 (rejoining his Lions teammate Yasumitsu Toyoda who was a coach for the team). 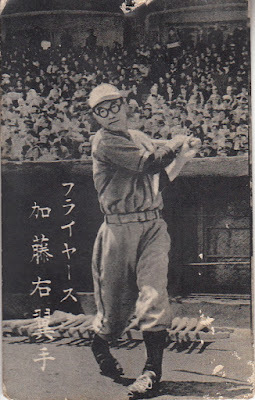 He retired after the 1970 season that he spent with the now Yakult Atoms. He was named to nine All Star teams (1956-57, 1959, 1961-66) and three Best 9 teams (1959, 1964, 1966). He played in four Nippon Series with the Lions (losing in 1954 and winning in 1956-58) and one with the Giants (winning in 1967 in which he won the "Outstanding Technique" Award). Last Saturday my wife and I escaped the frigid Mid-Atlantic for an extended weekend in Arizona. Our first stop straight from the airport was to Salt River Fields At Talking Stick in Scottsdale, the spring training home of the Rockies and Diamondbacks and, for two weeks this spring, the Hokkaido Nippon-Ham Fighters. The Fighters were playing a game against the KBO's KT Wiz that afternoon. We arrived at the game during the bottom of the first and sat behind Deanna Rubin and Dani who were in the first row behind the Fighters' dugout. We spent the game talking with them and just enjoying being out in nice weather. The game itself was pretty uneventful. 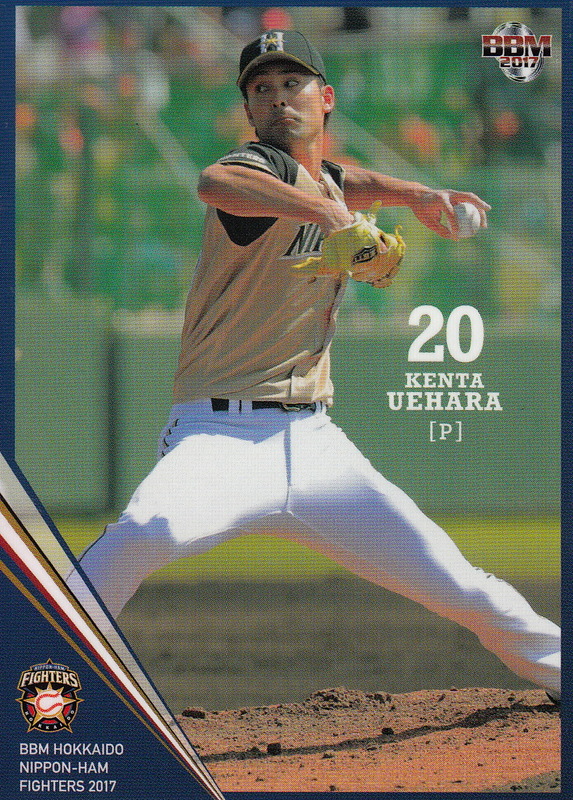 The Fighters went up 1-0 in the bottom of the third on a home run from Kenshi Sugiya (who spent a couple weeks this winter with the Brisbane Bandits who won the Australian Baseball League championship over the weekend). The Wiz tied it up in the sixth but the Fighters rallied to score three runs in the bottom of the eighth and went on to win the game 4-1. 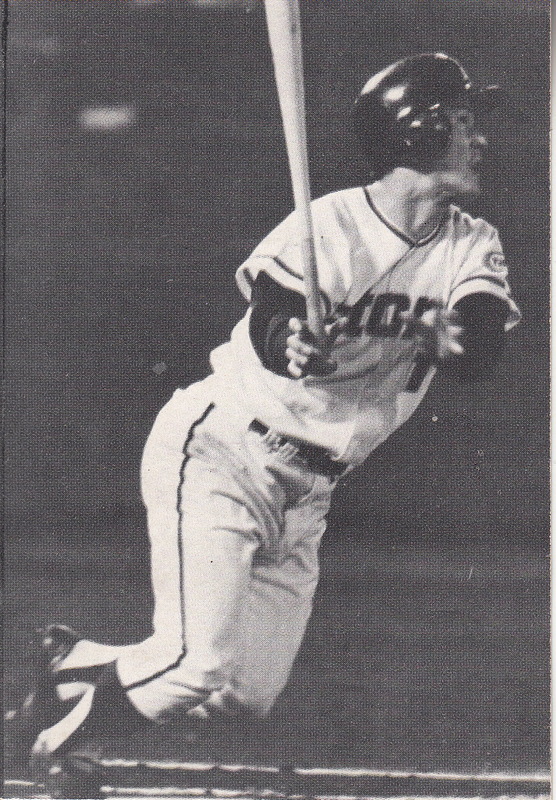 (It was kind of odd that they played the bottom of the ninth despite the Fighters - who were the home team - leading.) Justin of Charm City Autographs (who had intended to be at the game originally but had to work) told me that he was surprised the Wiz had even tied the Fighters since the Wiz hadn't sent any regulars up from their training camp in Tucson. I was kind of disappointed after the game that there really wasn't any opportunity to get any autographs from the players. It looked like Yuki Saitoh was the only one who stopped to sign for anyone in the stands. I was also disappointed that I didn't see any media, scouts or front office people that I had brought cards for. Saturday was the only day that we were going to spend at the Fighters' camp - we went to a bunch of National Parks, Monuments and Forests during the other two days we were in Arizona - so all the cards I brought were for naught. There's more pictures and a partial box score for the game at the Fighters' website. Check out Dani and Deanna's Twitter feeds for more photos from the game and the rest of training camp - they were both there for a couple days. An outfit called Phrake Photography posted a bunch of pictures from the game on Facebook and published a link on the NPB Reddit page.